Marinated in dill, black pepper, sea salt and sugar for a superb natural taste. Gravadlax, literally "buried salmon", is a traditional preserved food historically made by salting salmon in pits beneath the ground. In our modern interpretation, fresh Scottish Salmon fillets are marinated in our own special blend of dill, black pepper, sugar and sea salt. 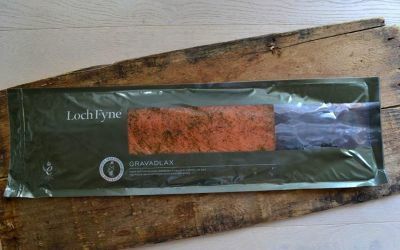 Gravadlax is an impressive party dish with its own aromatic flavour, quite different from the smoked variety. Serve on its own or with freshly baked bread or compliment with a sweet honey, dill and mustard sauce.